Lalvin EC-1118 The EC-1118 strain was isolated, studied and selected from Champagne fermentations. Due to its competitive factor and ability to ferment equally well over a wide temperature range, the EC-1118 is one of the most widely used yeasts in the world. Red Star Pastuer Champagne A strain of Saccharomyces bayanus, has been derived from a pure culture slant of the Institut Pasteur in Paris. This strain has been widely used in the U.S. since 1968. It is a strong fermenter with good ethanol tolerance, and will readily ferment grape musts and fruit juices to dryness. This strain also has good tolerance to free sulfur dioxide. This strain is recommended for all white wines, some reds and for fruit juices. Although this yeast is somewhat flocculant, it is not commonly used for sparkling wine. Pasteur Champagne has been recommended, by several sources, for restarting stuck fermentations. Ferments best between 15°C-30°C, (59°F-86°F). Lalvin 71B-1122 The selection was designed to isolate yeasts that would produce a fruity yet fresh character in wine that would live long after fermentation. It also metabolizes 20-40% of the malic acid, making it a good choice for high acid juices. Red Star Cotes Des Blancs A strain of Saccharomyces cerevisiae, has been derived from a selection of the Geisenheim Institute in Germany. It is a relatively slow fermenter, identical to Geisenheim Epernay, but producing less foam. This yeast requires nutrient addition for most chardonnay fermentations. Côte des Blancs produces fine, fruity aromas and may be controlled by lowering temperature to finish with some residual sugar. It is recommended for reds, whites, sparkling cuvées and non-grape fruit wines (especially apple, it is reported). Ferments best between 17°C-30°C (64°-86°F). Sensitive below 13°C (55°F). ​Lalvin K1-V1116 K1V-1116 strain was the first competitive factor yeast to go into commercial production and has become one of the most widely used active dried wine yeasts in the world. 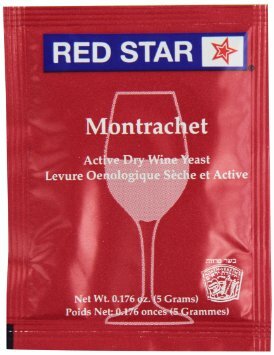 Red Star Montrachet A strain of Saccharomyces cerevisiae, has been derived from the collection of the University of California. This strain has been widely used in the U.S. since 1963. It is a strong fermenter with good ethanol tolerance, and will readily ferment grape musts and fruit juices to dryness. This strain also has good tolerance to free sulfur dioxide. This strain is recommended for full bodied reds and whites. It is not recommended for grapes that have recently been dusted with sulfur, because of a tendency to produce hydrogen sulfide in the presence of higher concentrations of sulfur compounds. Montrachet is noted for low volatile acidity, good flavor complexity, and intense color. Lalvin D-47 This strain was isolated from grapes grown in the Côte de Rhône region of France. D-47 is a low-foaming quick fermenter that settles well, forming a compact lees at the end of fermentation. 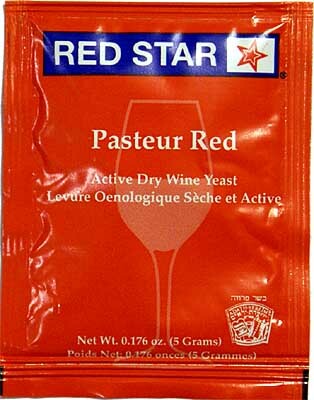 Red Star Pastuer Red A strain of Saccharomyces cerevisiae, has been derived from the collection of the University of California. This strain has been widely used in the U.S. since 1963. It is a strong fermenter with good ethanol tolerance, and will readily ferment grape musts and fruit juices to dryness. This strain also has good tolerance to free sulfur dioxide. This strain is recommended for full bodied reds and whites. It is not recommended for grapes that have recently been dusted with sulfur, because of a tendency to produce hydrogen sulfide in the presence of higher concentrations of sulfur compounds. Montrachet is noted for low volatile acidity, good flavor complexity, and intense color. Lalvin Bourgovin RC-212is recommended for red variThis strain was selected from fermentations produced in the Burgundy region by the Bureau interprofessionnel des vins de Bourgogne (BIVB). It was selected for its ability to ferment a traditional heavier-style Burgundian Pinot Noir. 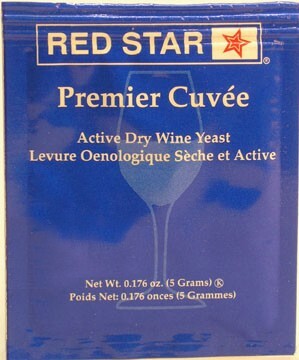 Red Star Premier Cuvee A strain of Saccharomyces bayanus from a French wine yeast, is a special isolate of Red Star Yeast & Products. This yeast has good tolerance to ethanol and free sulfur dioxide, and ferments to dryness. Premier Cuvée is noted as a very low producer of foam, urea, and fusel oils. It is recommended for reds, whites and especially champagne. This yeast is reported to perform well restarting stuck fermentations. Winemakers have remarked that Premier Cuvée is the fastest, cleanest, and most neutral fermenter offered by Red Star®. Ferments best between 7°-35°C (45°-95°F).